Foundations and nonprofits form coalitions because they can achieve greater impact working together—but that can be easier said than done. The Packard Foundation’s Children, Families, and Communities Program supports a network of organizations working to give all kids a smart and strong start in life. To achieve far-reaching change, grantees wanted better ways to communicate with one voice about the critical role that adults—parents, grandparents, teachers and others—play in children’s development. But with grantees spread across the country and working in the often-disconnected worlds of early learning and health, aligning messages and communication strategies presented a major communications challenge. The Hattaway team worked closely with Packard grantees to developing a Digital Communications Toolkit designed to put communications research, ready-to-use messages and other resources at the fingertips of every communicator in the coalition. Collaboration and co-creation were critical to creating a resource that everyone could use effectively. Our team began by conducting interviews and workshops with grantees to investigate what types of communication resources they needed and how they would interact with a digital platform in their day-to-day work. Throughout the process, we worked with a steering committee of grantees who provided feedback, participated in user-testing, and helped develop a rollout strategy. A digital communications toolkit gave coalition members access to shared, persuasive messages and tools for reaching key audiences. Today, more than 40 organizations in California and across the country have access to a growing library of digital tools and resources to shape their communications. Speaking with one voice, these organizations can more effectively advocate for better early learning and health policies that improve the lives of children, families and communities. 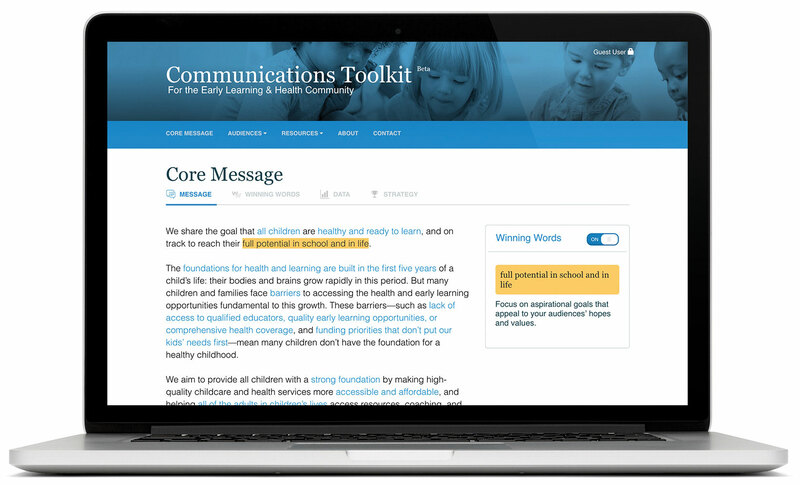 When grantees log in to the Digital Communications Toolkit, they find messages and research that can immediately be incorporated into their own communications. A core narrative helps unite coalition members around common language, and interactive Winning Words let them readily identify the most motivating words and phrases. They also find messages geared toward key audiences: Grantees who need to draft a letter to the local parent-teacher association, for example, can access messages that have been tested and tailored to parents and educators. The toolkit also allows them to dig deeper to explore the data behind the messages.